It looks like we could be seeing the first footage from Sony's upcoming Spider-Man Animated Movie very soon. The movie is going to center on Miles Morales and will be theatrically released in 2018. The movie doesn't even have an official title yet, but producer Chris Miller, one half of the duo Lord and Miller, has teased something is coming soon related to the Spider-Man animated movie. Chris Miller, who was previously directing the Han Solo movie for Lucasfilm before he and Phil Lord were let go over creative differences, took to Twitter to tease the arrival of the possible trailer. Yesterday, the director tweeted, "Something's coming," but offered no context, leaving fans to speculate on their own. 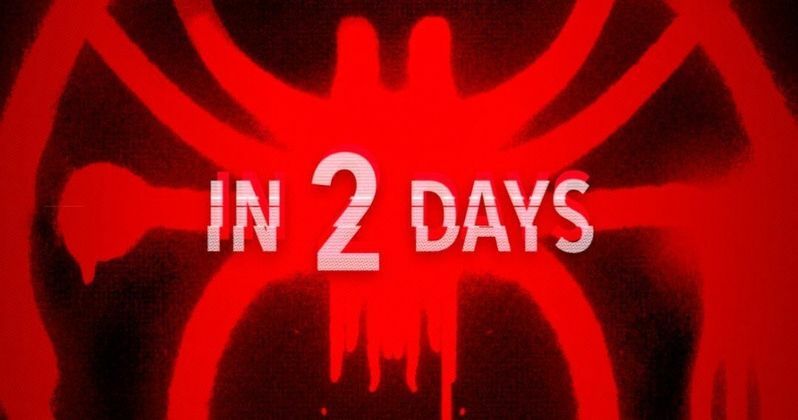 Now, Miller has shared a photo of the log for the Miles Morales Spider-Man movie, with "In 2 days" written on it. At bare minimum, we're getting some sort of reveal related to the movie, but it's likely we'll see some sort of initial footage. Sony is holding a panel on Saturday at Comic Con Experience in Brazil, so it's likely this reveal, be it a trailer or just some information about the untitled Spider-Man animated movie, will come at that time. The Get Down star Shameik Moore has been tapped to voice Miles Morales in the movie, with Liev Schreiber (Ray Donovan) set to voice the movie's villain, who has yet to be named. Ice Cube is also part of the voice cast as Morales' father. Bob Persichetti and Peter Ramsey serve as co-directors on the movie, with Lord and Miller writing the script and producing. Miles Morales may not be quite as famous as Peter Parker, but the character has become insanely popular in recent years. In the world of Marvel Comics, Miles Morales took up the Spider-Man mantle in the Ultimate Marvel Universe, which takes place outside of the main Marvel Comics Universe, following the death of Peter Parker. Morales is a young kid of African American and Hispanic descent and has powers similar to the more well-known Spider-Man, but with some differences. The character was introduced in 2011 and the demand to see him on the big screen was almost immediate. Those fans are getting their wish next year, even if it isn't going to be in live-action form. The untitled Spider-Man animated movie will not be connected to the Marvel Cinematic Universe in any way and is expected to stand totally alone. The movie is currently set to arrive in theaters on December 14, 2018. With that in mind, it may be a bit early for a full-length trailer, but a teaser of some sort wouldn't be totally out of the question. At the very least, a title reveal and some firm details on what the movie will be about should be coming over the weekend, based on Chris Miller's recent social media activity.